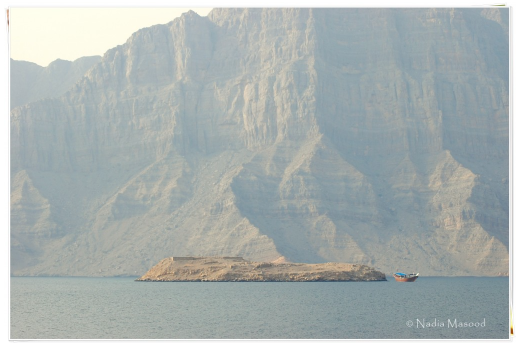 We are in Musandam—an exclave of Oman—separated from the rest of the country by the United Arab Emirates. So we are technically in Oman, but the land we are on is not geographically attached to Oman, but to the U.A.E. And what breathtakingly beautiful this place is! It takes about an hour to an hour-and-a-half drive (depending on how frequently one stops to take pictures) along a well-built road carved out of the solid mountains, and running along the coastline. 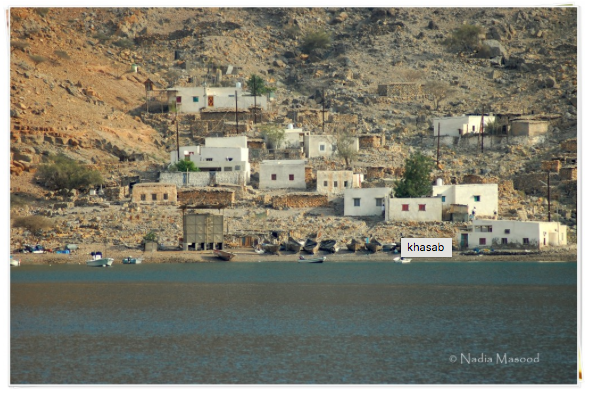 Now, Khasab is a quiet town. Or maybe because it’s a Friday afternoon. The shops are closed and there’s not much traffic on the road. But those who are out seem to know each other, nodding with familiarity as they meet. Also, it seems as if everyone owned a boat around here. We drive around Khasab in search for a travel and tours office to book a dhow ride, but finding them closed, we decide to see what lay ahead. 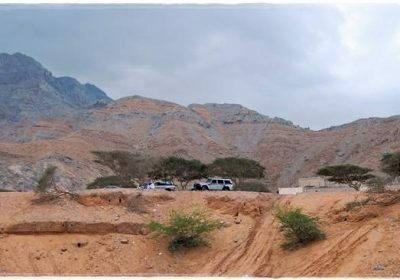 We are told there’s a corniche a few kilometers down the road, so we drive on a straight road that seems to bend ahead behind a mountain. 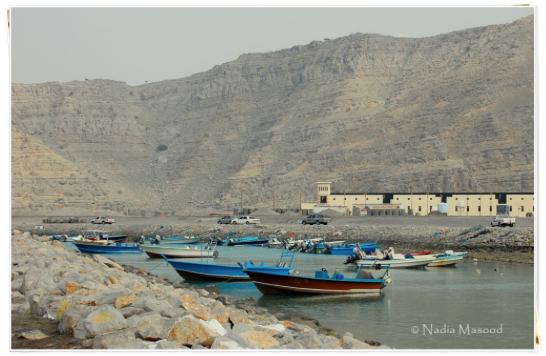 Thirty minutes later—and with no sign of the corniche—we decide to head back to Khasab. Yep, that’s where we book our trip. Actually if you book a trip from Dubai, it will cost you 650 dirhams per person (pick and drop, whole day dhow ride, and lunch). Here, we pay 130 dirhams for a 2.5-hour dhow ride, plus snacks. Snacks = apples, bananas, sodas, mineral water bottles, coffee, and tea. We follow one of the tour guys up to where all the pretty dhows are docked, park our cars, and hop across three dhows to get into ours. And we see fishes swimming about in the clear water as we climb one dhow to the next. The wooden dhow consists of an upper and lower decks. We leave our shoes and bags on the lower deck and run up the upper deck to have an uninterrupted view of the surroundings. Fortunately, we have the dhow all to ourselves. The air is fresh but very cold and it rocks the dhow so that it’s difficult to balance while taking pictures. Our wooden dhow sails gently between the mountains, giving us ample time to soak in the spectacular view surrounding us. Every now and then, another dhow or boat would sail pass, and we wave at each other. We initially ignore the apples and bananas, but since the last meal we ate was breakfast, we attack the bananas. Still hungry for more, we finally give in and bring the apples up on the upper deck. Two very young Omani boys are in-charge of the dhow; they do not speak much English, so we hardly have any conversation with them. And boy, are they the sweetest apples I have ever eaten! Anyway, down at the lower deck are beautiful red cushions one can sit back on and relax. There is also a plastic basket containing masks, snorkel and fins set. Next to it is another basket filled with neatly folded towels. There’s a small changing room in one corner and a shower head too. So if you are into diving and snorkeling, they have the gear you need. We also sail past a tiny village. The only way someone could enter and leave this place is by boat. Majority of the population is engaged in fishing, so it is not surprising that someone would prefer to live this close to the sea. But this place is literally secluded from the mainland. I find that scary. Luckily, they have electricity. I wonder if they have internet access as well. We also spot a boy—who appears around eleven years old, and not a day older—sailing past in his boat, all by himself! Where are his parents? We look at him with our jaws dropped; he smiles at us in return, and waves a hand. I’m telling you once again: this place is breathtakingly beautiful! SubhanAllah. If He created this much beauty on earth, how much more beautiful heaven must be! We are joined by another dhow. A guy starts whistling and clapping his hands. Minutes later, the dolphins appear. 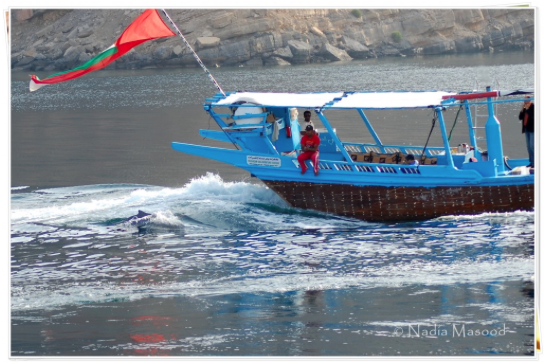 The dhow picks up speed and the dolphins playfully follow suit. We don’t know how to whistle this particular dolphin-whistle, so we clap our hands instead. And take pictures. And make a video. And laugh like crazy. And point our fingers at the dolphins and get all excited like kids. And take more pictures. And continue clapping. And the dolphins love following us. We spend the next thirty minutes playing with the dolphins like this. It’s one of the most amazing moments of my life. The sun begins to set and the wind gets colder, so we reluctantly bid our dolphin friends goodbye. We are going to miss you, buddies. We finally return safely to shore hungry and exhausted, but very happy. Right next to that travel office is a restaurant, where we finally have lunch dinner at 6 pm. Dinner = soup, salad, chicken/mutton mandi, and tea. 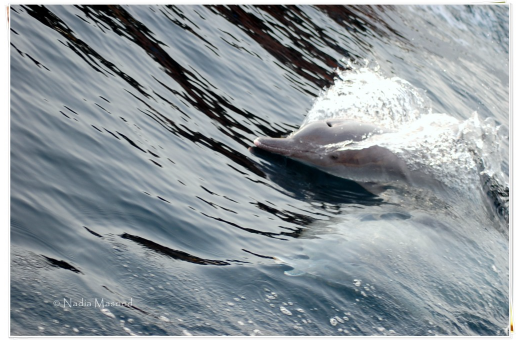 I took a million photographs of these dolphins and ended up with only 2-3 decent ones. You are right; they are impossible to capture! Also, due to over-excitement, I completely forgot to put my camera on burst mode. I could’ve taken more shots. The photos are really pretty. The red cushions are nice and that salad looks so yummy. I had the most unappetizing lunch ever :(. Those red cushions are very popular in this part of the world. 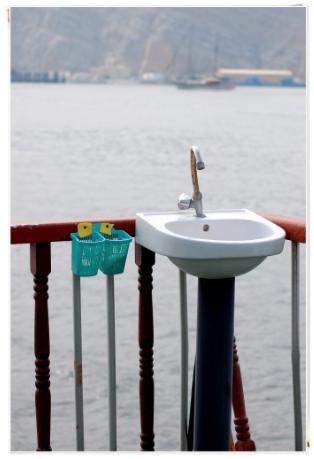 I think every dhow (and traditional restaurant) has them. We enjoyed our mandi a lot. We sat on the floor (yes, with the red cushions and all :D) and ate everything. Sorry about your lunch though. Hope dinner would be pleasant. Thank you so much, captureuniverse! In Qatar, the red cushions would be called Majalis or Majilis cushions – meaning a place of sitting. That’s right, Margie. That’s what we call it here in the UAE too. The pictures are amazing, even more so on Facebook. 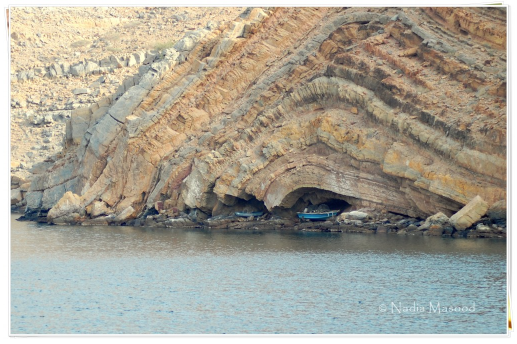 Oman is truly a beautiful place. I am Trailing comments… came here from Sajib’s blog..
Hi Rajiv! Welcome to the blog. Dolphins are very friendly creatures. There are dolphin shows too where you can see these beautiful beings performing acts, but nothing beats watching them swim freely in the ocean. Oh wow Nadia, congratulations on ur website! fantastic pictures!!! Ha! You’ve changed the layout..again! 🙂 this is also good! Wow,Nadia! You must have enjoyed yourself screaming like a kid at the dolphin 🙂 I’ve only been to a live dolphin show and I enjoyed it very much.Very smart and intelligent creatures…like us! 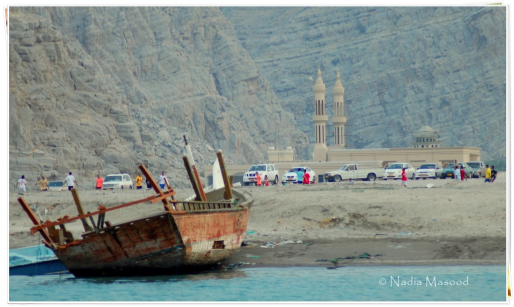 Really enjoyed the pics of the dhow and your little perceptions of your journey.Is that you above in the pic? Yesterday I saw a hijabi girl with her camera hanging by the shoulder going to the mosque and I instinctively was reminded of you.And I was telling my husband (again) about your beautiful photography.And I think your pics and of all the natural beauty in the world are heavenly.This is one big awesome way how God blesses us on earth.Thank you for sharing! Yes, I’ve changed the layout again! I realized that I don’t need a header, plus the font size was smaller on that template. And since I post tons of photographs, I think it’s appropriate if I choose a ‘clean’ theme. No, that is not me, Lat. She’s Saima, a family friend. Very sweet girl, mashaAllah. It’s so nice of you to think about me when you saw that hijabi girl. I’m like ‘awwwwwwwwwwwwww’. Here’s a huge *HUG* to you. Wow, nadiamasood.com! Many congratz and now I really feel bad that I havent been visiting your blog. So many things have happened! Nisa, thank you so much! Welcome to the blog! i had a very nice time travelling with you via your story. am sure, the actual trip you took was even more pleasant. Walaikum Assalam, Mohammad. We had a great time, and the mandi was really good. It looks like biryani, only lighter on the spices. 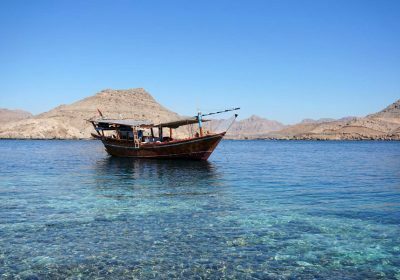 Oman is the place of natural beauty and adventures, Dhow cruise trip was awesome it traditional boat but i like that, thanks for sharing some overview about Oman. 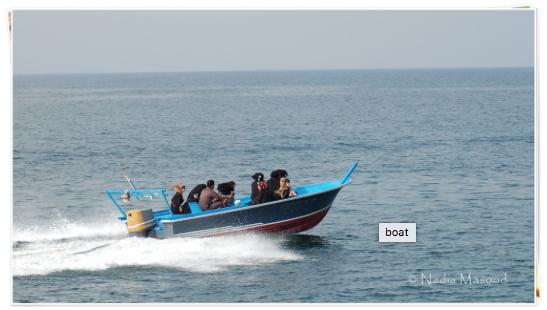 Khourshem recently posted..Why should you try khasab dhow cruiseonce in a life?